We would like to offer you our Uraoshi service upon your request when you make your knife purchase. It is a service free of charge when you purchase your knife. To receive this service, please add KNIFE-J-URAOSHI from "Related Item" when you purchase online for any traditional Japanese style knives next to your ordered knives or mention to customer service representative when you purchase over the phone or at store. Uraoshi is the flat part of the blade that goes around the back side of traditional Japanese style knives(single edged knives).Back of the single edged knife blades in fact are not flat but in the gentle concave shape. Uraoshi is the conditioning of the flat part of the traditional Japanese knives. Our Knife Sharpening Master Mr.Chiharu Sugai strongly recommends the Uraoshi sharpening process before the initial use of your traditional Japanese Style knives (such as Yanagi, Takobiki, Deba, Usuba, Kamagata Usuba, Kiritsuke, Funayuki or all other single edged knives). It is essential because Uraoshi will enhance the blade strength on the edge and align any unevenness on back side of the blade. Without uraoshi, the knife cannot be sharpened properly or to it’s fullest potential, and will be brittle. In this process Mr. Sugai will use several different grits of sharpening stones to achieve this method of sharpening. 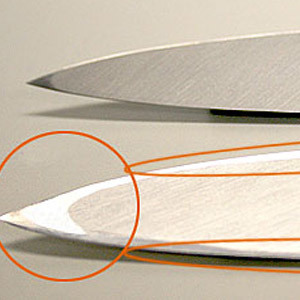 **Please note that once the knife is sharpened, it is no longer eligible for returns or exchanges.